Among the many forms of art in the castle of any king, there is usually a sword or two mounted on a wall. The Golden Knights Sword and Plaque is a knightly sword decoration for you to display on the walls of your own castle! 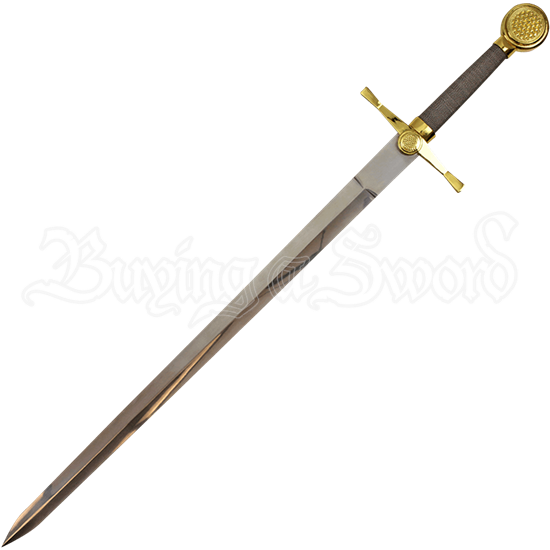 The stainless-steel blade of this sword has been crafted with a diamond-shaped cross section and a stamped neck near the golden colored hilt. The sword handle has been wrapped in wire. The golden wheel pommel of this elegant weapon sports a textured decoration that is echoed on a disc at the center of the cruciform guard. The plaque that this decorative blade comes with possesses a wooden appearance. Decorate your home with this knightly decoration, add it to your collection, or give it as a special gift to a friend or loved one who loves swords!